USC and Peking University have forged a partnership that could boost the quality of life for millions of Chinese individuals living with, or at risk for, a disability. 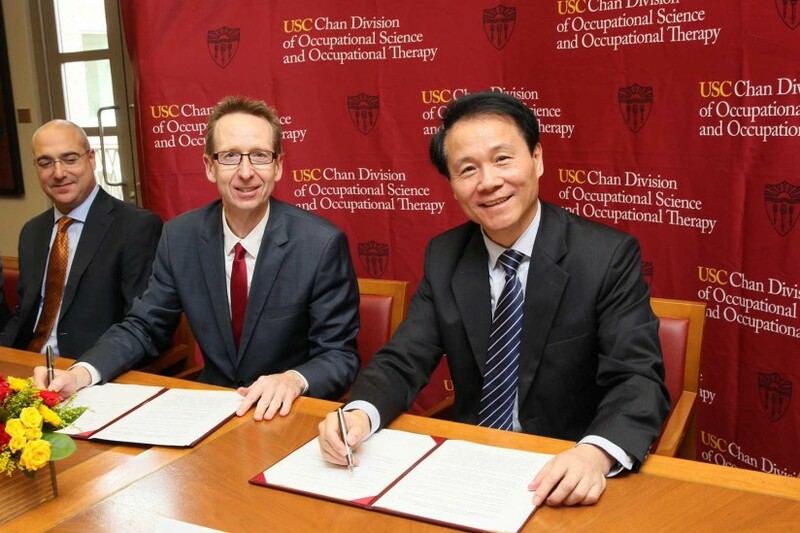 USC Provost Michael Quick joined a delegation of senior leaders from the Peking University Health Science Center to formalize a new partnership between the academic institutions to develop one of China’s first graduate programs specializing in occupational therapy. Alongside Qimin Zhan, president of the Health Science Center, Quick formally established the China Initiative partnership between one of China’s most prestigious universities and the USC Mrs. T.H. Chan Division of Occupational Science and Occupational Therapy. The announcement caps more than two years of intercontinental exploration and travel by USC Chan faculty members, including Associate Dean Florence Clark and the China Initiative’s Interim Director Julie McLaughlin Gray, to better understand the nuances of occupational therapy within China’s health care system and to identify an optimal partner capable of fostering the profession’s growth within the country. The China Initiative began in 2014 as part of a multimillion dollar gift from USC Trustee Ronnie C. Chan MBA ’76 and his wife, Barbara, to endow and name USC’s occupational therapy division and to establish a partnership with an elite Chinese university to expand occupational therapy research, education and practice. Thanks to the Chan family, we will be able to extend USC’s faculty expertise across the Pacific in order to fortify the global occupational therapy community. 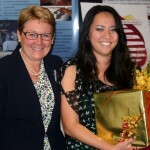 Currently, there is just one occupational therapy graduate-level program in China. Typically occupational therapy — as we know it in the United States — falls under the auspices of general rehabilitation therapy — which is a bachelor’s degree program. The China Initiative partnership builds upon that educational foundation, establishing one of China’s first graduate-level programs in occupational therapy. The program offers students a master’s in rehabilitation (with an emphasis in occupational therapy) from the Peking University Health Science Center through a program that will replicate the world-renowned curriculum at USC Chan. Graduates of the master’s program will then be eligible to apply to the post-professional occupational therapy doctorate program at USC. During the first two years of the partnership, USC Chan and PKU/Peking University Health Science Center faculty members will collaborate to develop the contours of the program, making sure it is responsive to the specific health needs of the world’s most populous nation. The program’s first faculty members will be individuals appointed by the Peking University Health Science Center to spend two years at USC Chan, earning both a post-professional master’s degree and a post-professional occupational therapy doctorate. These faculty members will then return to China to launch the Peking University Health Science Center program. In addition to establishing the master’s program, the partnership paves the way for Chinese PhD students to study at USC Chan. Once established and implemented, the partnership promises to continue the educational evolution of occupational therapy in China, training a new generation of practitioners to provide high-quality clinical services to the estimated 85 million Chinese living with, or at risk for, a disability. Occupational therapy is a health care profession focused on enabling people to better manage chronic disease and disability through sustainable, health-promoting activities and routines in order to live more satisfying and productive lives. USC has been ranked by U.S. News & World Report as the nation’s No. 1 occupational therapy graduate educational program for more years than all other programs combined, and USC has a legacy of professional leadership, including founding the nation’s first two-year, entry-level master’s degree in occupational therapy in 1962. Peking University is China’s first national university and the highest ranked in mainland China, according to the annual QS World University Rankings. Built in 1912, the Peking University Health Science Center was the country’s first school to teach Western medicine in the style of the British medical education system and now is among China’s most selective and respected medical schools. 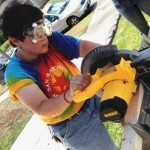 Occupational therapy student Donna Ozawa works the circular saw to construct a wheelchair ramp for a classmate. Donna Ozawa is pursuing a career that will allow her to combine her experiences and interests to help people lead healthier, happier lives.